After Trump’s refusal to recite the Apostle’s Creed at George H.W. Bush’s funeral, Jesse Lee Peterson argues that the Creed isn’t even a Christian thing in the first place. If you thought President Trump standing stone-faced during the recital of the Apostle’s Creed at George H.W. Bush’s funeral this week would shake the narrative of those who say he’s a devoted Christian, you’d be wrong, but that’s only if you don’t know anything about evangelicals in the age of Trump. 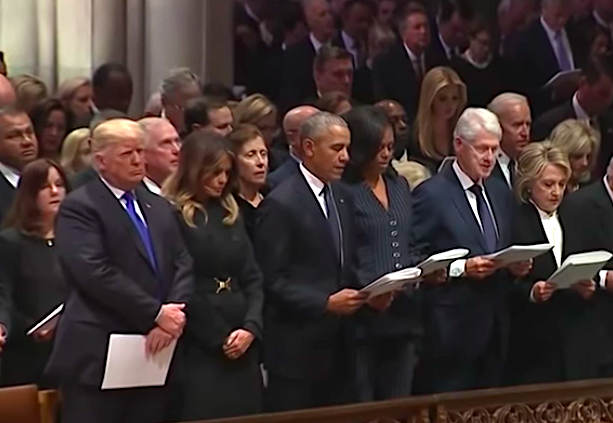 Press footage of the funeral showed much of the church and all the former presidents and their spouses reciting the Creed — all except Trump and First Lady Melania, who stood looking forward while not saying a word. The First Couple didn’t sing any of the hymns during the service either. Trump has huge support from evangelicals, many who believe and perpetuate the claim that he’s a devout Christian. So his non-participation in Christian traditions at H.W.’s funeral sparked considerable backlash online. But Peterson doesn’t see what the big deal is. As Snopes points out, The Apostle’s Creed is a statement of Christian belief commonly recited during services in a number of Christian denominations that varies in translation.